Even a bully of 50 Cent's stature and media savvy requires a little maintenance between thrashings. Unfortunately, the week that was Sunday, February 17th through Sunday afternoon, didn't allow for much respite. Just as the murmurs of a "Gucci boycott" began quieting down, 50 Cent's entire being and Universe was suddenly turned upside down - by news of an alleged NYPD-sponsored bounty on his head. To my surprise, Fif played it off as if he were completely unaffected. Personally-speaking, the thought of NYPD underlings running defiantly with a "shoot on sight" directive, sends shivers down my spine, and I'm standing safely out of bounds. 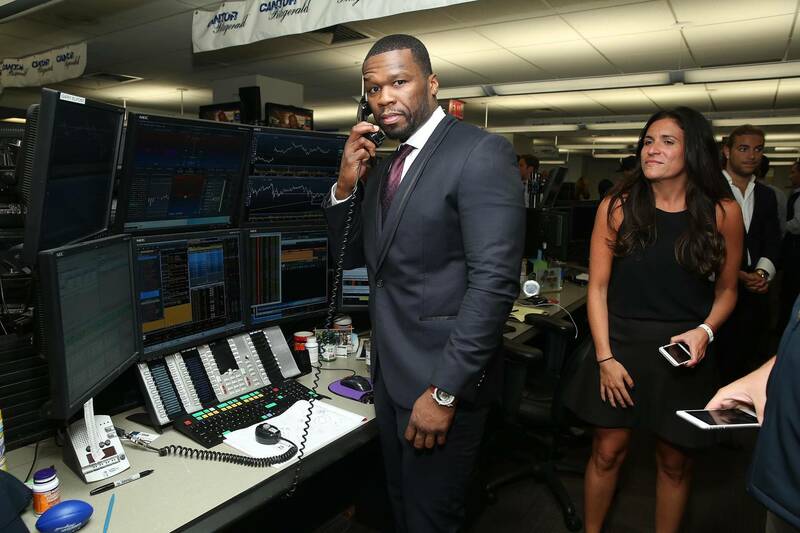 50 Cent wound up using the alleged bounty to sell one of his cable network TV shows, what else? Then he picked an indiscriminate fight with a public figure who'd seen his fortunes reversed in the span of a week. And then it happened again: 50 Cent, with all the insolence he could muster, fell trap to a fake "Kanye West" news alert floating in negligible space. As the weeks turn to months, the pattern in which 50 Cent operates on social media has become easy to discern. If and when 50 believes he's overstepped his bounds, or liable to lose a zero-sum contest, he simply powers forward like nothing ever happened. So, how did he fare in a week where "impartiality" looked unfathomable, even for the Mr. Rogers of the neighborhood? Let's find out by first looking into this "The Oath" he imparted on NYPD's internal affairs. To quote Jay-Z, who once famously bickered over the value of a 50 Cent cent coin, "Crooked officer, crooked officer! Why you wanna see me in a coffin, sir?" While no relation exists between 50 Cent and Jay-Z's questioning of law enforcement in 2008, the lyrics resonate to this day, especially with regards to Emanuel Gonzalez, the commanding officer who ordered the halfwit bounty on 50 Cent's head. It's been reported ad nauseam, and yes: Emanuel Gonzalez urged his underlings to "shoot him on sight," because he and 50 have a history of taking jabs at one another. It was after all Gonzalez with whom the NYPD entrusted with the crackdown on 50 Cent's "Get the Strap" slogan. The NYPD feared the popular expressive could incite violence through its perceived lethal connotations, and pervasive appeal on the Internet. As a result of the crackdown, legions of 50 Cent fans started harassing Gonzalez and his constituents at any given opportunity. It formed the basis of a contentious relationship with real-life consequences. Fortunately for 50 Cent, an NYPD-sponsored audit into Gonzalez' actions, and a wee bit of insubordination helped swing the pendulum in his favor. Had Emanuel Gonzalez taken the bait, and responded to any of 50 Cent's insults at such a crucial moment, the disgraced officer may have been liable to further punishment. That alone would have given 50 Cent the impetus to spend all his waking hours administering "cheap shots," as much as he could muster with Gonzalez couched in the NYPD doghouse. THE SELF-PROFESSED "GAY TUPAC" INCARNATE TAKES A WALLOPING. Elsewhere on the docket, 50 Cent picked a one-sided fight with Jussie Smollett, the disenfranchised Empire actor whose every bespoken action has become an article of mass consumption. The Jussie Smollett story needs little introduction; the Chicago PD have evidence negating the hate crimes that he reported, and that's just the beginning of the sordid mess. 50 Cent was evidently preying upon the very same "sensational elements" which have pitted Smollett against a host public figures with their own agenda and cause. 50 Cent revived interest in the scandal by reposting the meme that pokes fun at Smollett's self-immolation as the "Gay Tupac" incarnate of our era - comments he made during a concert shortly after the staged "attack." As is normally the custom, 50 Cent filed his response to Smollett, on Instagram, where a doctored cover shot of 2Pac's All Eyez on Me with a superimposed "Jussie" smile lie in wait. "It’s 2019 people,things are a little different now. Commander Emanuel Gonzalez would say, if you see him shoot him on sight," wrote 50 cent, as the caption to the uncredited oeuvre. KANYE WEST AT THE CHARITY STRIPE. Unfortunately, 50 Cent didn't fare quite as well, when he embarked on a smear campaign with Kanye West as his target. It all occurred so unsuspectingly: 50 Cent was scouring the social media feed like any other hoople, when a headline reading "Kanye West Scores 126 Points Against Wheelchair Basketball Team" popped up on his radar. Of course, the fake "Kanye West" news alert was uploaded under a heavily doctored thumbnail - so fake, that even an amateur MS Paint enthusiast such as 50 Cent would spot the difference. But in this instance, an 50 Cent figures he'd make a lewd joke, for no other reason but to sublimate his depleting serotonin levels for well-earned pick me up. Had 50 Cent not reposted it the Kanye meme/headline, its urban mythology would have sunk like Waldo in a sea of clones, but he didn't and the story gained a whole lot of unnecessary traction. Otherwise, the week was like any other for 50 Cent: he bickered with Teairra Marí, she bickered back. Her insistence being: Tekashi 6ix9ine distilled his snitchy ways by associating with the Jamaica, Queens rapper. Marí was the Queen of the ROc for a brief moment after Amil stepped out of the limelight, and now she and 50 Cent are reduced to squabbling over tater tots the shape of a $.